This week, Networkers teamed up with Girls in Tech to hold an evening event with students and graduates at the University of Texas, Dallas. As corporate partners of Girls in Tech (GIT), we support the aims of the global non-profit to engage, educate and empower women in technology. And this event offered all of those things; promoting the importance of diversity and inclusion in today’s technological world. 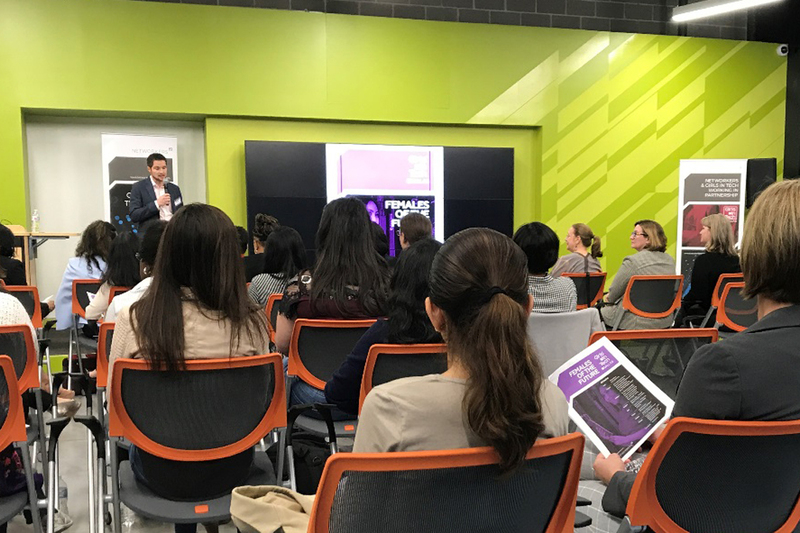 Richard Carter, Regional Director – Dallas, Networkers joined forces with GIT’s Rachel Tang to host the evening which brought together representatives from a number of top tech companies and young women studying STEM (Science, Technology, Engineering and Mathematics) subjects. There is an innate problem in the US right now which sees a huge drop off in the interest girls and women have in studying technology as they progress through their education. Statistics from a recent Girls who Code survey (2017) suggest 66% of 6-12 year olds express an interest in computer science but this number drops to 32% for 13-17 year olds, and just 4% for female college freshmen (i.e. those in their first year of university). With this in mind, several of the speakers advised how important it is to find something you love for your career. Karen Cox, Senior Director at Fujitsu and Monisha Jain, Special Projects Manager at Nokia, spoke about how exciting it is to be a female in the technology industry and how there is a great career path there for those who strive for it. Robyn Stringfellow, Chief Operating Officer of Mark Cuban Enterprises the entrepreneurial software company reiterated this and expressed how important it is to have a vision and a personal mission statement, so you go after what you want. Her fellow speaker, Claire Aldridge, Vice President of Remeditex Ventures - a venture capitalist company, agreed and gave the advice to find what you are good at and stay laser focused with your plan. Another common theme throughout the evening was the ‘mentor mentality’. With women making up only 28% of the technology workforce in the U.S. (Girls who code, 2017), a number of the speakers recommended finding someone in your discipline or industry who can help advise you on their career path and share the lessons they’ve learnt along the way. There are many reports that suggest the benefits of a gender diverse workforce and this was something which many of the speakers alluded to. At a recent event led by the Association of Talent Development in Dallas, we heard how adding just one female to a team increased its success by 40%. It was suggested that women think differently to men, and that the best concepts and solutions come from discussions with people who have opposing viewpoints and ideas. One company which has put this theory to the test is Ericsson. The telecoms giant recently conducted an internal survey and ranked groups by their level of diversity. The results indicated that business groups with a more diverse workforce outperform other businesses financially through higher operating margins, sales revenue, customer numbers, profitability and market capitalisation. The business groups with greater diversity also achieve twice the employee engagement, innovation and customer focus compared to groups which are less diverse. By 2020, it is predicted that there will be 1.4 million jobs available in computing fields in the US. US graduates are on track to fill 29% of these but only 3% of them are women. In a world that is becoming increasingly outpaced by technological advancements, we need as many tech-savvy people as possible to make sure we utilise technology in the right way and that means bringing the best talent together, regardless of gender.